After checking my calendar, it was all filled up for the month of August so I’ll post our collaborative challenge next week. However, I couldn’t resist doing two polls today! I’ve been conjecturing and wondering a few things so I thought it would be fun to share my questions with you. Some of you have expressed a preference among Richard Armitage in a beard, stubble or the clean-shaven look. Well I have been thinking about what type of facial hair Richard Armitage’s character will have in the tornado movie which is now filming in Detroit. Here’s your first poll: What facial hair will RA wear in the tornado movie? I am also curious whether Richard Armitage will use his British accent or an American accent in his role in the tornado film. Can you predict? 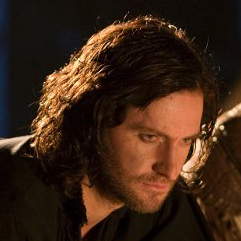 Here’s your second poll: Which accent will Richard Armitage use in the tornado movie? P.S. Look for our challenge announcement on Monday. This entry was posted in Poll, richard armitage and tagged accent, actor, beard, richard armitage, stubble, tornado. Bookmark the permalink. 70 Responses to Poll Party Time! Both are good questions to ponder. I’d like beardy and British, thank you! I wonder if the 3rd Hobbit film will impact the cast much in their searches for new roles as they will need to fit in publicity junkets for yet another movie. We live in interesting times! OMG – you could hang out at the Today show! I went for clean-shaven and British as that would be my preferance, but I bet I’m wrong anout both! @phylly3: Only time will tell. 🙂 I haven’t heard of any RA sightings during filming of the tornado movie. I hope stubble and British, but I fear he’ll have an American accent. If he shaves, now that we have Hobbit movie #3 will he have to grow the beard back when they start filming again? (I love the beard, but I miss the stubble). I don’t think there would be any more filming for the final installment of the movie. Peter Jackson made it clear they have more than enough footage. (Maybe a bit here and there, but Mr. Jackson has quite the editing team I’m sure). I’m pretty sure RA said in one of his Comic-Con interviews that they were far from done filming, and that some of the major battles had yet to be filmed? I’ll have to look for the vid clip, but I think that’s what he said 🙂 🙂 That’s before we knew for sure there was a 3rd film. @Faboamanto: You’re right about the quote. Here’s the link to the Comic-Con interview: http://www.ign.com/videos/2012/07/14/the-hobbit-richard-armitage-interview-comic-con-2012 It comes near the end of the clip, at about 2 minutes in. WoW! I’m with the majority on this poll yay!!!! That’s a first for me 😀 Although my votes express my wishes and not the result of a reasonable thinking on the character. I love the beard but miss the stubble and I looooooooooooooooooove his british accent. @Ana Cristina: Woohoo, in the majority! I wonder what that feels like, LOL! I think it will be “Stubble amongst the Rubble”!!!! That’s a caption just begging to be made in to a graphic….hint hint graphic goddess!!! @tyme4t: Perhaps the tornado movie will become a trilogy too and they can use your title, LOL! If it’s a “found footage” movie I think there’ll be a bit of dramatic facial hair growth so I went with 2 of the three and I think he’ll attempt an American accent. I think he’ll be clean shaven but after tragedy hits and he searches for his son, his facial hair will grow, blessing us with rich thick beauty. I selected his British accent because as much as I love him, his American accent needs work and the Brit will come out anyway. Very fun poll for “Twister of Love” (Bccmee working title…). I think that in order to be different from the Thorin character, he should be clean-shaven,so this is my option and of course,with british accent. @Tereza: Oooh good reasons for your answers! Good luck in the poll! Maybe I’ll make another blog post when the first interview or picture comes out. The first choice is what I would like to see. That would be clean and stubble. I’d like stubble and British – let’s face it, if you’re stumbling around after a tornado you won’t have had time to shave!! @Ania: Maybe they’ll use time-lapse photography to show the beard growth, LOL! @Teuchter: I agree that RA looks older with the beard. When he’s well-scrubbed and closely shaven he looks boyish. Maybe he can play a dual role, LOL! I would love for the beard to stay a (long) while, but went for clean-shaven in the film because he’s playing a dad… Don’t know if that makes any sense, it’s just a feeling…Although Teuchter is saying the exact opposite in her comment – I hope she’s right!! British accent, please!! I think there’s more tolerance for different accents these days, even in very American films, so I hope they will allow him keep the accent that still makes me shiver with delight every time the man speaks! Great questions, I’m looking forward to the results! @IngeD3: Maybe the tornado will blow off his beard along with his shirt and tattoo! *giggle* Yes, we have all cultures in North America, so there’s no reason RA can’t keep his British accent. Time will tell…. I hope that he’ll start out clean shaven–not because I dislike the beard, but as someone said above to distinguish his look from his Thorin profile–and then go stubbly as events conspired to keep him from shaving. Ha! And I want to hear RA’s velvety British Baritone accent. I work at a university and we have people from around the world. So it is not inconceivable that a British bloke comes to the States to live and work. Ha! P.S. And yea as well, for my being with the majority this time! That’s because Hugh Grant could not do a different accent to save his life! No offence to Hugh, but he’s quite limited that way. I chose the beard, though I was thinking maybe he was going to go for a goatee in this new flick. That way if he still needs the beard for further filming of The Hobbit, it wouldn’t take long to get the whole thing back. Although, without the beard he seems to be perpetually stubbly, so I doubt it would be a problem if he did shave it and have to grow it back. I chose the British accent. I heard one of his attempts at an American accent and it needed work. Unless he was working on it while in NZ, I’m thinking he’s going with the British one. Which is perfectly fine by me. I LOVE his natural accent. I don’t know if I would like hearing him with an American one. Hugh Laurie does an awesome American accent. But if Hugh isn’t available, I would be more than happy to volunteer to coach him. I love Richard clean shaven, stubble and the beard ( as long as there is no stubble on the neck). But for the tornado movie it has to be the stubble. Because when would a man have the time and the razor to shave? As for the accent I originally thought American, because I don’t hear to much about tornadoes in England. Then I decided Richard’s character could have married an American ( I volunteer for that part ) and moved to America, thus keeping his English accent. But isn’t the wife dead? I thought he was playing a widower in the tornado movie? Another thought occurred to me. He has by all accounts been hanging around with Lee Pace so maybe he has been able to perfect his American accent with him! 🙂 I would naturally prefer him to keep his English accent though, as he always sounds so wonderful. LOVE this! I’m losing in the poll 🙂 can’t wait what the REAL results will be! I opted for clean shaven, despite being a a lover of the beard. New character needs a new image. Looking at the pics from comic-con I think his current hairstyle also makes him look older. He has grown his hair longer on top, maybe in preparation for the new role? As for accent, I’m hoping it stays British but expecting it to be American. I wish this was called “Tornado of Love.” The plot doesn’t appeal to me right now and that fake title is very amusing. Haha. I assume an American accent because often we acquire a certain way of speaking when we live somewhere for so long. RA is very committed in stepping into a character’s world and life, so if they want him to sound like an American, he will. I just don’t want it coming out horribly like the Minnesotan accents in the movie, “Fargo.” Now I am getting awful flashbacks from that movie I can’t stand. Hehe. @Brooke: If it does become a trilogy, then a second title can be tyme4t’s suggestion: Stubble Amongst the Rubble! I will accept him with facial hair as long as it doesn’t become a reason for me to use the word gross in my daily thoughts. Some facial hair styles would look bad on him. A mustache is one of them. @Teuchter: Remarkable! We are both great minds, LOL! Reblogged this on Kathie Brown Summary.